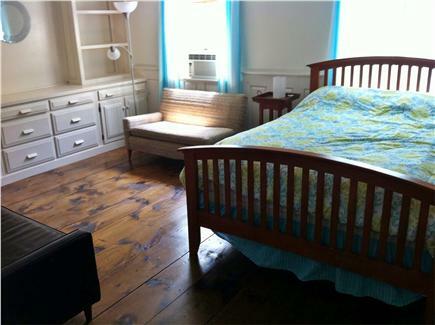 Enjoy this spacious, 2,200-square-foot Dutch Gambrel home, located on the ocean side of Route 6. It has all the modern amenities, including wireless internet, air conditioners, a DVD player and a huge 52-inch flat-screen TV. 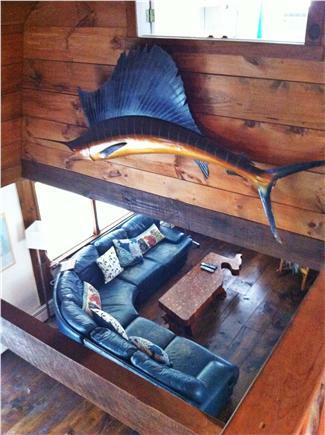 The house is a short drive or bike ride to the beautiful Wellfleet ocean beaches, ponds and bike path. The deck wraps around two sides and has patio furniture, a grill and an enclosed outdoor hot-water shower. Main level: Enter from the deck into the well-equipped kitchen and adjoining dining area with a huge round table that seats 8. Enjoy watching TV in the living room while relaxing on the comfortable leather sectional. 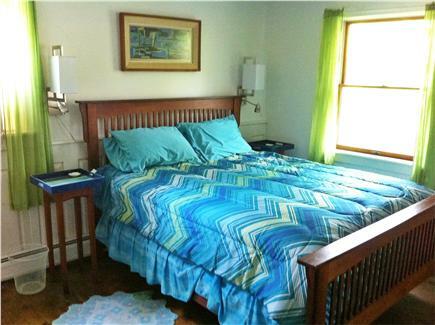 Master suite #1 has a queen-sized bed, a full bath with tub and shower, plus a large walk-in closet. There is also a half bath on this level with a washer and dryer. 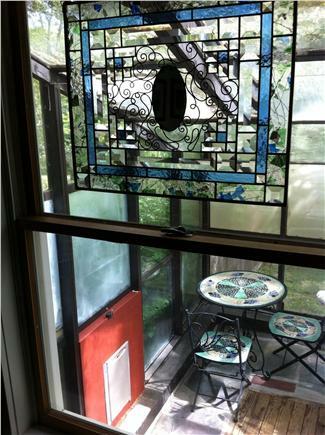 A sunroom off the living room has a dog-flap that leads to a fenced-in area. Upper level: Master suites #2 and #3 each have a queen-sized bed plus a single bed (one single is a daybed, the other is a pullout sofabed). They have their own full baths with tub and shower, and lots of built-in drawers and closets. 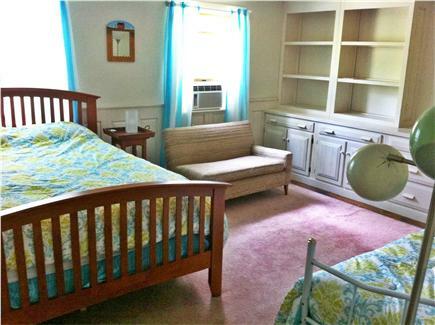 General: Window air conditioners are in each bedroom and in the great room. 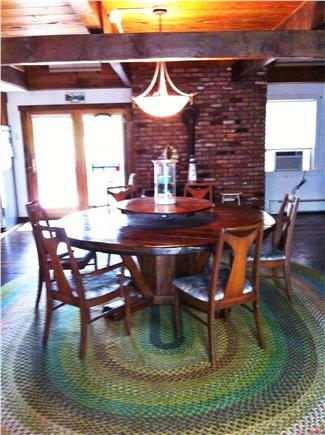 There are wide-plank maple floors with rugs throughout the house. The house is just as listed. There is an open floor plan downstairs with one master bedroom - and 2 additional master bedrooms upstairs, all with their own bathroom. The house is in a nice location on a corner lot with a large deck and is great for entertaining guests or accommodating a large family. The owners are very responsive and attentive and we had an excellent stay. 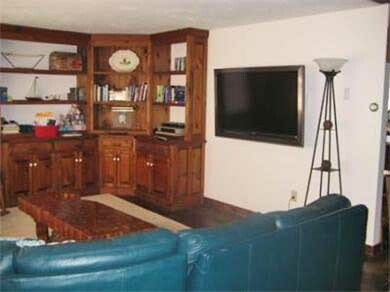 Susan and Bob's home is very charming and comfortable and in a lovely area. 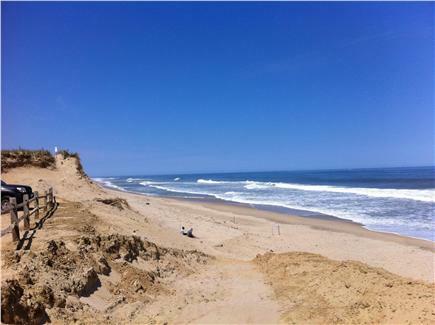 My husband and I took off every day to sample the many beaches The town of Wellfleet is picturesque Went to Provincetown and took a whale watch, Perfect for a very hot day! Never saw the ocean so peaceful. BBQ fresh fish on the grill, and most of all relaxed, had fun prepping and cooking meals. Our golden enjoyed the spacious outdoors and even learned to use the doggy door, great help especially at bedtime. We spent a week here with our dog, two kids, and multiple family members visiting throughout the week. We loved the open floor plan and bedroom setup (every bedroom has a full bath). For smaller kids, Duck Pond down the street is about as good as pond swimming gets. The house is comfortable and spacious. It was equipped with everything we needed, and Susan and Bob are gracious hosts. We have been renting this home for 5 years and just leave the deposit to secure our next vacation. The home is very spacious and comfortable. The owners are extremely cooperative and diligent. Proximity to everything on the outer Cape. It's a quiet location, and well equipped, we have made wonderful memories here. The house was clean and comfortable and enabled us to have our adult children and our dog. Well equipped with essentials like herbs and spices and cleaning supplies. Wellfleet ponds are terrific. A Fabulous Week in Wellfleet! We had a fabulous week in Wellfleet renting this dog friendly 3 bedroom home! It is very difficult to find a home that is this nice and allows you to bring your dog! The owners are very accommodating and respond quickly to all questions and concerns. The house comes with a doggy dog into a fenced in area for the dogs to void. There are also several tie-outs on the property. Plus with the fenced in porch the dog can be outside with you and still be safe! Besides the luxury of bringing the family pet, the house also works out great for having our 2 grown daughters with their significant others. There are 3 separate bedrooms with their own bathrooms which works out beautifully for a family of 6 adults! 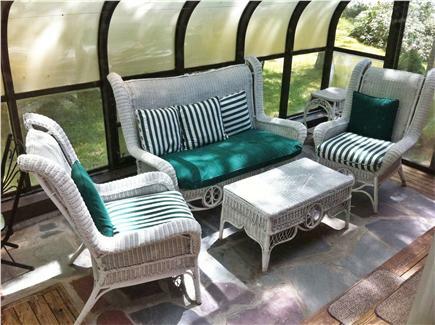 Coupled with the spacious living room to play a game or watch a show together, the outdoor patio set is great for a gathering. If the weather is inclement, the spacious dining room table can more than accommodate a big lobster dinner! We found the house to be well equipped with everything we needed to cook all 3 meals daily. The house came with the biggest lobster pot I have ever seen! The washer and dryer is certainly a plus to have with the supply of towels available from the owners. 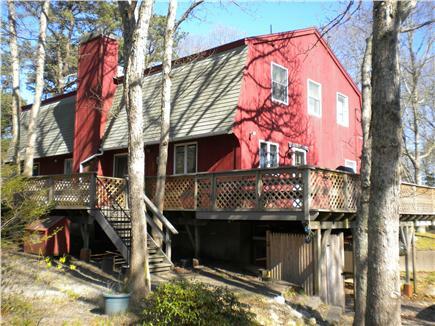 Finally, the location of the house is convenient whether you are heading to the beach/bay/town/ponds/or the bike trail! Plenty of parking at the house and easy to get to! I loved to get up in the morning to take the dog to Uncle Tim's Bridge for an early morning walk before we headed off for the day. Cannot wait to return to this great house next summer! My family and I had a most comfortable and relaxing stay at this home. It was stocked with everything we needed, and the amenities for our dogs was the icing on the cake. We made use of the trails across the street for jogging or accessing the beaches. There was plenty of parking space, even enough room for our boat. We all want to return here again. Highly recommend. Our family, 3 couples, an infant, and a small dog, stayed in this great house for a week! We all enjoyed our bedroom suites for comfort and we loved the open kitchen, dining area and living room for gatherings! The deck is wonderful for lazy afternoons after the beach. We also enjoyed the house's great location! This house is great!